In 1898, the Riverside University Health System Medical Center (RUHS), Riverside County’s first general hospital opened its doors. 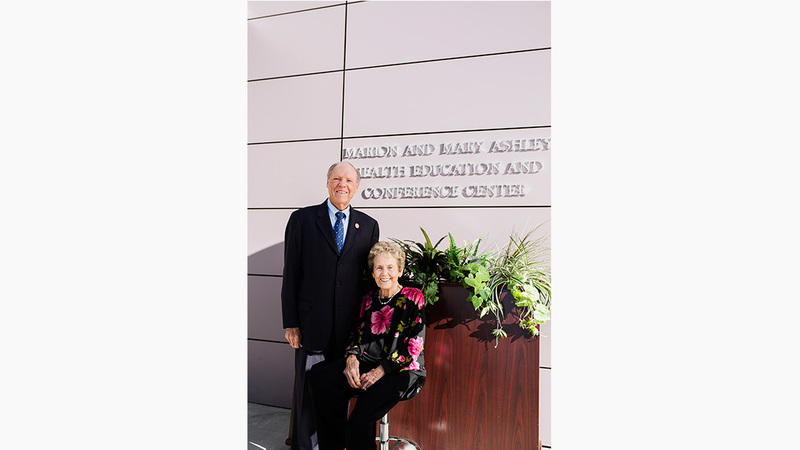 Recently, the RUHS and Conference Center, was renamed in honor of retiring Riverside County Supervisor Marion Ashley and his wife Mary, for their long-lasting commitment to public service. On Wednesday November 14, the couple stood among their friends, family and colleagues who congratulated them on this accomplishment. The newly named campus of the public teaching hospital, Marion and Mary Ashely Health Education and Conference Center, is where thousands of doctors, nurses, pharmacists, and other top-preforming heath care professionals train annually. Those in attendance agreed that both wife and husband, due to their tremendous amount of public service, deserve to see their names on what they helped build. Mary Ashley is a founding member of the nonprofit RUHS Foundation. Since it launched 29 years ago, the Foundation has raised millions of dollars to support pediatric and other programs at the Medical Center through signature events like the Festival of Trees, an event that takes place each year. This year the event will be held November 20 through 28 in downtown Riverside. Since Marion Ashley was elected County Supervisor of the Fifth District in 2002, he has watched the Medical Center grow and expand into the “pillar of excellence” it has become today. At the end of 2018, he will retire from his longtime post after 16 years. In the 125-year history of the RUHS Medical Center, the hospital has faced challenges staying afloat. Just five years ago, Dr. Arnold Tabuenca, Chief Medical Officer at RUHS Medical Center said it was losing $1 million a week. The Ashleys, partners for 50 years in marriage and public service, were celebrated in a video tribute which included their colleagues and friends. Marion Ashley called his and Mary’s decades in public life together “the journey of a lifetime.” Now, both in their 80s, the Ashleys will retire knowing that they have accomplished so much and that their legacy will live on.